Although we had our first snow this week (only at higher elevations, thankfully) and a freeze warning, I am still wallowing in end-of-summer vegetables and haven’t really turned the corner into the fall foods yet. Soon enough, right? Today I had a thought that I might take the dogs to the top of the mountains to wallow in the fresh snow. But then, I thought, why rush things? 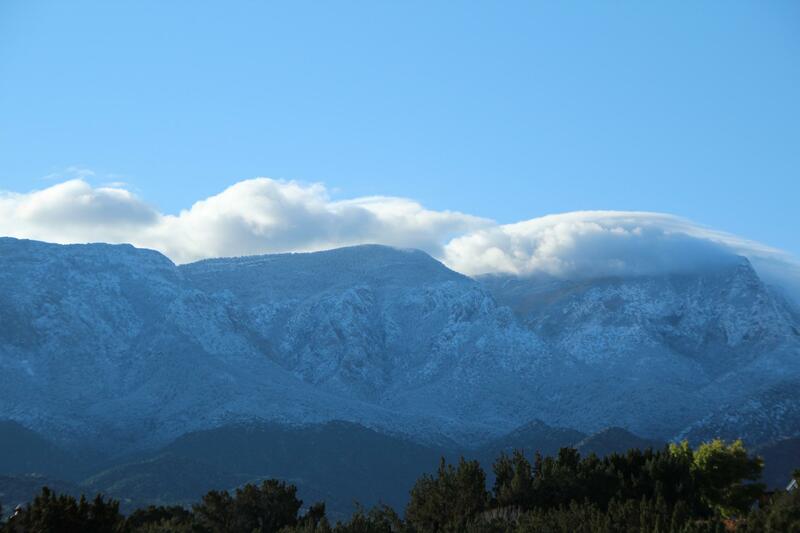 The snow will be here – down at our elevation – soon enough. The first snow as seen from our front porch this weekend. Luckily it was above 7000'. So last night when my friend Jennifer, over at The Gluten Free Advocate, messaged me to say that there was a freeze warning in our neck of the woods, my husband and I hurriedly put on our head lamps and ran out to harvest the more tender items still growing in the garden. I should have taken a picture of it all. Basil, sage, parsley, cukes, tomatoes (both the red and green), tomatillos (even the tiny ones), okra and peppers of all kinds. We covered both counters in the kitchen with it all. And of course it didn’t freeze. But I am still glad we harvested it all. Although in hindsight I wish we would have left a lot of the tomatoes on the vine as I already had a pile of ripe ones on the counter top and now I have to figure out what to do with all these green tomatoes, besides feed them to the chickens! And I made pesto. Then for lunch I had a pesto-tomato grilled cheese sandwich. And I have cucumbers in the frig to be eaten. So I am stalled in summer. And I am okay with that. Quinoa Salad with tomatoes, cucumbers and parsley – gotta eat up the garden goodies before the freeze really does show up! Moroccan Chickpea Salad – one of our favorites. Poblano Pinto Bean Stew – okay, this is starting to get a little fall-like. What about you, are you still stuck in summer? Or are you feeling the pull of pumpkin and squash and warm, cozy soups? Be sure to jump over to this week’s Gluten Free Menu Swap, later in the week, to see what everyone else has planned. They’ll probably have more fall-like ideas for you than I do! Welcome back to the swap! and I love your picture. I wish I could say that my cat eats the cranberries, but alas. He just chases them. But hey, I’ll take what I can get!